One of the most influential and creative scholars in medical anthropology takes stock of his recent intellectual odysseys in this collection of essays. 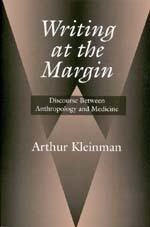 Arthur Kleinman, an anthropologist and psychiatrist who has studied in Taiwan, China, and North America since 1968, draws upon his bicultural, multidisciplinary background to propose alternative strategies for thinking about how, in the postmodern world, the social and medical relate. Writing at the Margin explores the border between medical and social problems, the boundary between health and social change. Kleinman studies the body as the mediator between individual and collective experience, finding that many health problems—for example the trauma of violence or depression in the course of chronic pain—are less individual medical problems than interpersonal experiences of social suffering. He argues for an ethnographic approach to moral practice in medicine, one that embraces the infrapolitical context of illness, the responses to it, the social institutions relating to it, and the way it is configured in medical ethics. Previously published in various journals, these essays have been revised, updated, and brought together with an introduction, an essay on violence and the politics of post-traumatic stress disorder, and a new chapter that examines the contemporary ethnographic literature of medical anthropology. Arthur Kleinman is Professor of Anthropology, Harvard University, and Presley Professor of Medical Anthropology and Chair of Social Medicine at Harvard Medical School. He is the author of Patients and Healers in the Context of Culture (California, 1980), Social Origins of Distress and Disease (1986), Rethinking Psychiatry (1988), and The Illness Narrative (1988); coauthor of World Mental Health (1995); and coeditor of Pain as Human Experience (California, 1992) and Culture and Depression (California, 1985).